Hello: How absolutely intriguing this is. The 1909 postcard does, in fact, enlarge very well to show quite an amount of detail. 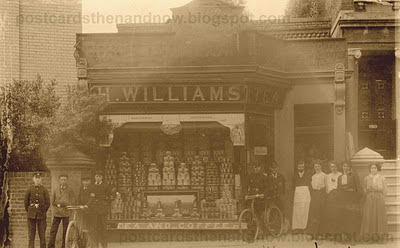 As we said in our comment on your recent Cleveleys post, we do not really collect old cards but this is so fascinating and so interesting that the shop remains albeit, as you say, with much of its original charm sadly lost. This is an interesting picture. I do admire the way they were able to stack all their tins like that. Fascinating photo and great detective work. The boys on the left have odd armbands. What could that mean? my parents used to own this shop so it's great to be able to see this old postcard and how it used to look. Did you find anymore postcards of the area? haven't had a chance to look properly through your website.